That God’s service to His people in Word and Sacrament will be a great blessing to you. That you will see Jesus and His love for us sinners through the faithful preaching of His Word in Law and Gospel, and the administration of His Sacraments. That as the Holy Spirit calls and gathers us each week, we faithfully receive the gifts of our Lord Jesus Christ, who died on the cross for our sins, and has risen and ascended on high to assure us of salvation. Are the gifts we need and receive each week in the Divine Service. These gifts strengthen us for daily living, and in service to one another in our daily lives through good works. See Our Mission and Core Values. All services, and most music and hymns are from the synodically approved Lutheran Service Book Hymnal or The Lutheran Hymnal. Unlike some LCMS congregations, Christ Lutheran Church does not have “contemporary worship,” or “blended worship” services. A laminated, in-depth description of The Divine Service can be found in the pews. This resource will give you the meaning, an application for daily living, liturgy, (order of service) and the Scriptural Basis. Mid-Week Evening Worship services, or Mid-Week Advent and Lenten services do not typically have the Lord’s Supper. “Our Lord serves us today through His holy Word and Sacraments. Through these means, He comes among us to deliver His forgiveness and salvation, freeing us from our sins and strengthening us for service to one another and to the world. At Holy Baptism, He puts His name upon us, pours His Holy Spirit into our hearts, and rescues us from sin, death, and the devil. Through Holy Absolution, He pronounces His forgiveness again and again. With His holy Word, written in Scripture and preaching into our ears, He daily proclaims His abiding love for us through all the joys and sorrows of life in this world. In His Holy Supper, He gives us His own body and blood to eat and drink as a priceless gift to nourish and strengthen us in both body and soul.” Lutheran Service Book, vii. Holy Communion is offered to baptized communicant members of the Lutheran Church Missouri Synod (LCMS) and others in altar and pulpit fellowship with the LCMS. All non-LCMS/AALC visitors are welcome to come up to the altar to receive a baptismal blessing by crossing their arms in front of them. We take seriously the spiritual care of those who commune at our altar. Those who eat and drink our Lord’s body and blood unworthily (not recognizing the real bodily presence of Christ’s body and blood) do so to their great harm (1 Cor. 11:27-29). Furthermore, Holy Communion is a confession of what is taught and believed at this altar (1 Cor. 11:26). Therefore, any who are not yet baptized, instructed and confirmed in the teaching of the LCMS through Luther’s Small Catechism, in doubt, or who hold a confession (beliefs) differing from that of the LCMS, and yet desire to receive the sacrament, will want to first speak with a pastor before communing. For further study see: Matthew 5:23f; 18:15-35; 26:26-29; 1 Cor. 11:17-34. A staffed nursery is provided for children ages 4 years and under in the Education Wing, Room 120 during the 8:00 and 10:45 a.m. services. An unstaffed calming room (cry room for children) is available at the back of the Sanctuary during the church services. The sound system will allow you to hear the service in either room. Sunday School is available between services for ages 3 through high school. 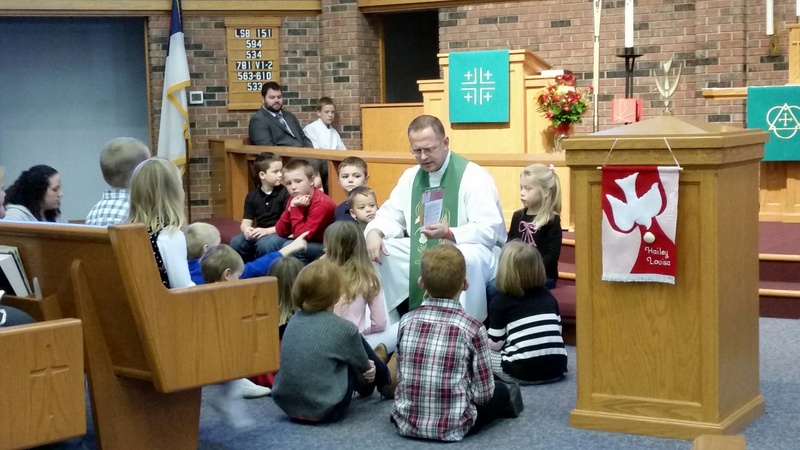 How do I find our more information about Christ Lutheran and membership? Catechism instruction classes for non-LCMS members are offered by the Pastors on an individual basis.